REDSTONE ARSENAL, Ala. -- While the Shape the Fight initiative realigned directorates and divisions to focus more closely on mission, the Army Materiel Command's Ready Army Civilian initiative is now working to ensure all employees have the right levels of education and skills to ensure continued mission success. As the director of Army Materiel Command's Resource Management (G-8), Sue Goodyear is leading efforts to ensure her directorate's employees meet the Ready Army Civilian standard. "Shape the Fight has changed what it takes to be a Ready Army Civilian," Goodyear said. "To meet that standard, our employees have to know how to adapt and how to be more proactive in recognizing issues that affect readiness and mission success, and then work toward solutions. Operationally, employees need to know that what they are doing every day and how they are performing their responsibilities does influence Soldiers." AMC Resource Management is responsible for requesting resources, receiving and executing funds, and ensuring manpower requirements are funded. G-8 employees manage appropriated funds -- those budgeted for AMC by Congress -- and Army working capital funds -- those funds paid to AMC entities by U.S. and foreign government customers for requested equipment or equipment modifications. In fiscal year 2018, AMC Resource Management oversaw the expenditure of $8 billion in appropriate funds, $8 billion in Army working capital funds and $2 billion in research and development funds within the AMC enterprise. "We allocate money from appropriated funds to the major subordinate command, and we manage and monitor how those funds are spent," Goodyear said. "With working capital funds, we make sure our major subordinate commands have the correct rates set so they recoup expenses. For example, if a customer -- say the Program Executive Office for Ground Combat Systems -- needs a tank refurbished or modernized, they will provide funding for that modernization to Anniston Army Depot, where the work will be done." AMC Resource Management teams, which include a command analyst, accountants and auditors, conduct budget forecasting for appropriated funds and working capital funds. "Appropriated funds are being projected right now out to fiscal year 2025," Goodyear said. "With working capital funds, we are executing fiscal year '19 while also budgeting for fiscal year '20 and programming for fiscal years '21-'25. We are always looking five to seven years out at any given time." Under Shape the Fight, AMC Resource Management added a Current Operations Capability to be more responsive to shifts in military priorities. AMC funding to its major subordinate commands is impacted often by changes in Army strategies, such as the recent buildup of forces along the nation's southwest border and the changes in strategy in South Korea. "Any current operation, any change in current operations, can affect our funding and where that funding will be spent in the current year," Goodyear said. "We need to know where we are spending dollars, if we are spending the right amount of dollars and if we need to request additional funds to meet requirements. The Current Operations Capability cell allows us to stay better informed on how we can and should respond to changes in Army strategy." Another change through Shape the Fight was the addition of a new G-8 mission to more closely manage and monitor AMC contracts both at headquarters and throughout the major subordinate commands. The Contracting cell includes two AMC G-8 specialists and two Army Contracting Command specialists. "We need a more detailed overview of contracts across the command," Goodyear said. "We want to know the impact of those contracts so that we can provide the commanding general with information he needs to make the right decisions." AMC G-8 has tasked the Resource Management organizations within AMC's 10 major subordinate commands to also establish Contracting cells to more closely oversee contracts. "Beyond monitoring current contracts, these cells will help build our contracting strategy for the future," Goodyear said. Shape the Fight changes have opened up new opportunities for AMC G-8 employees to grow their experience and to have a more significant impact on the future direction of the AMC enterprise, she said. "These changes help to improve AMC and help AMC to be more responsive to warfighter needs throughout the enterprise," Goodyear said. Now, as AMC embarks on the Ready Army Civilian initiative, Goodyear and her team of supervisors are ensuring G-8 employees have the skills and experience as well as leadership capabilities to meet new, shifting and expanding work responsibilities. "Our employees are learning what it takes to be a Ready Army Civilian," Goodyear said. "At headquarters, our responsibility is to ensure that resources are available to meet our missions, whether that involves tanks and helicopters or uniforms and ammunition. Through our work, we make sure the AMC enterprise has what it needs to meet the Army's mission." 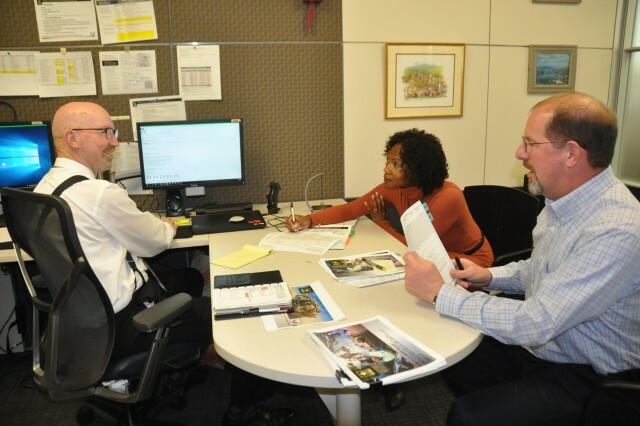 At its very basic, Ready Army Civilian begins with training, she said, adding that all her employees will strive to obtain their Financial Management certification. There are a host of financial management and leadership courses that can add depth to the educational level of employees. "We want to broaden the horizons for our employees. We want them to think strategically in their careers and in how they can develop themselves to be better employees," Goodyear said. "Employees need to take opportunities for developmental assignments and to learn other things -- both professionally and personally -- that make them better at their job. We want them to be prepared to meet challenges and to do 100 percent of the right work." Today's Resource Management environment is growing with data that can be used to provide better management of Army funds. The issue is that employees need to be able to analyze that data, she said. "We have to be able to look at the data and determine if it brings value to sustaining the mission or if it's just data. Employees need to be able to interpret data so that it can be used to make decisions," Goodyear said. At a recent AMC Resource Management summit, Goodyear led a discussion on upcoming changes in the Resource Management field, and how those changes will require new skill sets and affect the mission. "There is a lot of change in Resource Management and we are all working toward growing with that change so that we can better support the AMC enterprise," she said. Resource Management employees work in four key areas -- Manpower, Accounting, Budget/Programming and Audit. "As we move forward, budgets will become tighter while the mission will continue to expand," Goodyear said. "Employees must be prepared to provide more intensive oversight of resources and more intensive oversight of contracts. Employees need to be cross trained so they understand how one key area can affect another key area, and how Appropriated Funds and Army Working Capital Funds are used to ensure resources are available. Our employees need to have the knowledge base to be able to correlate spending with readiness and to be able to question if we are spending funds in the right way to support readiness." Resource Management supervisors must have the skills to coach, mentor and teach their employees so they continue to have a positive influence in a challenging work environment. Developing both soft and hard skills -- both people characteristics and work capabilities -- is essential in moving the organization forward in its mission, she said. "We want our employees to grow in their skill sets and be accountable for their work," Goodyear said. "We want them to have confidence in their abilities and have the support they need to get the job done. As we work to improve the workplace, it is our hope that employees want to come to work, want to make a difference and want to contribute to this workforce." It is imperative, she said, to develop high performing employees and a high performing workforce. To that end, supervisors must make sure they have the skills to help their employees in their development. "We want supervisors to be able to mentor their employees and pinpoint areas where their employees need to grow," Goodyear said. "Better employees translate to a better workforce. Supervisors and employees must be adaptable to the situation. They need to be able to analyze the challenging resource issues that we face and provide options for leaders to make decisions that benefit AMC and the Army and its Soldiers."